#3459 - Original UNIVERSAL PICTURES and AMBLIN ENTERTAINMENT Costume from the 2000 Movie, The Flintstones in Viva Rock Vegas! The Sequel to the original Flintstones live action film, this version stars Kristen Johnston ("3rd Rock from the Sun"), Jane Krakowski ("Ally McBeal") Stephen Baldwin and Mark Addy! This is the classic and original turquoise blue suede dress worn by Jane Krakowski. The Production tag reads "Change # 4,6,9,11, Finale with scene information. 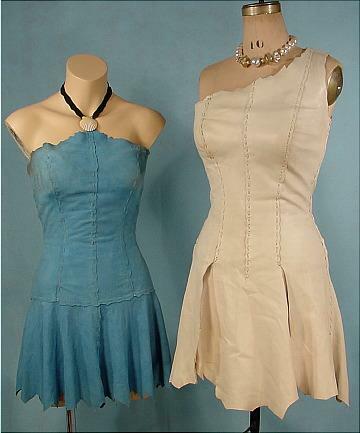 This awesome dress comes from the Burkett's Hollywood Museum in Branson, Missouri collection, sold at auction. Comes with the original production tag information. 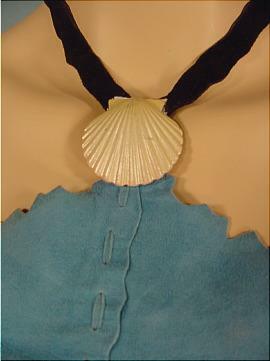 Extremely well-made costume with inner wool "corset" and heavy zipper back, and attached "necklace" to complete the look. The suede is quite dirty (mostly upper bodice) and will need a suede cleaning, but other than that, it's in great condition. 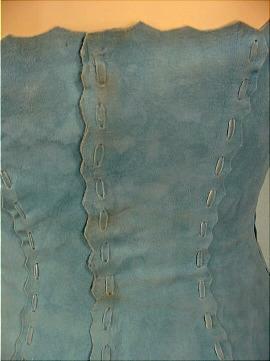 Measures: 34" bust, 25" waist, up to 36" hips. All you need is a pretty little blue bow for your hair and a great pair of legs.